Eastern Auctions: Eastern Auctions Public Auktion Auktion ist bereits beendet! Provenance: "Labrador" Collection of Airmails, Harmers of London, February 2003; Lot 3011 - realized £88,223 inclusive of the buyer's premium against a pre-sale estimate of £75,000. Christie's Robson Lowe (Zurich), May 1988; Lot 666 - illustrated on the front cover of the auction sale. Aptly described as "Certainly the greatest rarity of all Newfoundland airs and one of the most important covers of Aerophilately." Literature: Excerpt from Cyril Harmer "Newfoundland Air Mails" 1984 revised and updated edition - page 31: "Since 1953 at least four Martinsyde covers have come to light and two of these are exceptional. One was franked with two 2c Caribous, one of which has the normal MS "overprint". The envelope is addressed to London and has the April 19 St. John's postmark. The other envelope, equally exciting and doubtless also unique, was sent to a lady in London. This cover bears a 5c. Caribou with the normal MS "overprint". Both are almost certainly unique and must rank amongst the most highly prized airmail covers although on two attempts they flew only a few hundred yards." Although the Martinsyde "Raymor" got off the ground before the successful Alcock-Brown Vickers flight, it soon failed, as it did on two other attempts May 18 and July 17, resulting in the airplane being wrecked shortly after take off, but without casualties. Shortly after the first attempt, Major Morgan returned to England for medical reasons. 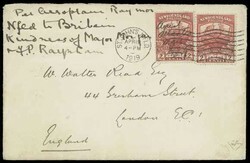 After the third attempt, Major Raynham personally hand carried the mailbag upon his return to England by ship; only to be delivered months later to the British postal authorities on January 7 where all known Martinsyde covers were backstamps with the London F.S. 66 7 JA 20 double ring datestamp. AN OUTSTANDING AND UNIQUE PIONEER FLIGHT COVER. A MERE 18 COVERS HAVE BEEN REPORTED FRANKED WITH THE 3 CENT CARIBOU. THIS IS THE ONLY KNOWN EXAMPLE OF THE VERY RARE MARTINSYDE MANUSCRIPT ON THE 2 CENT CARMINE RED.